Pádraig Harrington speaks to reporters on the range before his third round. The third round might have been as disappointing as he feared but 13 months after confessing that he was “close to the heebie-jeebies on the greens,” Pádraig Harrington could thank his belly putter for keeping his title hopes alive in the Travelers Championship at TPC River Highlands last night. “Happiness is a long walk with a putter,” was Greg Norman’s memorable way of summing up the restorative powers of good putting and having used his newly-acquired belly putter to hole 300-feet worth of putts in the first three rounds, it appears that the Dubliner is going places again. A brace of four-under par 66s left the 41-year old just two strokes behind former Masters champion Bubba Watson entering last night’s third round. And after hitting just seven greens in regulation yesterday, Harrington’s day was summed up by the nine footer he holed for par at the 18th for a two over 72 that left him on six under, just four strokes adrift of Canada’s Graham DeLaet (65), Charley Hoffman (66) and long-time leader Watson (70), who dropped three shots in his last six holes. Fearful of becoming a slave to high expectations, Harrington had already played down any excitement about ending a five-year PGA Tour drought on Friday night, pointing out that he wasn’t “doing cartwheels” about the state of his game. “You can’t always rely on holing 20 to 25-footers,” he warned. Poor wedge play and some wayward driving had forced him to rely heavily on his belly putter over the first two days and while he missed three putts in the five to seven foot range yesterday, his putter saved him from carding an even bigger number. 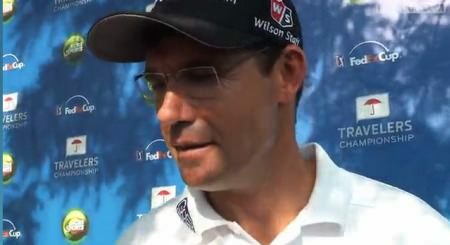 Harrington’s pre-round prophecy about the expiry date on long putts eventually proved correct. While he opened his day by holing a 21-footer for par at the first, he was soon seven shots adrift of Watson after dropping two strokes on the front nine. Despite holing from all angles over the first two days, his worst fears were confirmed when he managed to hit just one green in regulation the first five holes. That was the par-four second but after leaving himself nearly 40 feet for birdied, the raced his first putt seven feet past and three putted for a bogey. Par saves from three feet at the third and six feet at the fourth kept his round going but he short sided himself at the 223-yard fifth and missed a 10 footer for par. When he missed an eight footer for birdie at the 574-yard seventh, he holed one from seven feet at the ninth to turn in one over par, six strokes behind Watson, who got off to fast start with birdies at the second, third and sixth moving him three strokes clear of Hoffman on 13 under par. A missed five footer at the 10th cost Harrington another shot which he recovered by hitting his tee shot to two feet at the 158 yard 11th. A bogey quickly followed at the 12th, where he drove into sand and over shot the green. But it could have been far worse. In water in two at the par-five 13th, he hit a 72 yard fourth to five feet and saved par before holing another a five footer for par at the 14th, a 10 footer for par at the short 16th, a three footer at the 17th and that nine footer at the last. Whatever about Harrington’s troubles from tee to green, he has clearly regained some confidence in his putting in recent weeks following his surprising decision to try the belly putter last month. “I’m starting to get comfortable, no doubt about it,” he said in Connecticut. “I struggled last year reading the greens, which led to a lot of indecision in my putting stroke, which manifested itself in my giving up the short putter. Harrington’s wife Caroline insisted he speak to Bernhard Langer, famous for overcoming the yips, at the 2012 Masters. Harrington got confirmation from the German maestro that he was on the right track in his search for a cure. Harrington blamed his indecision in choosing the right line as the real problem with his putting and by moving to the belly putter he has taken many technical doubts out of the equation. “I am trying to be a bit more committed with my lines and the long putter has certainly helped me mechanically get set up and putt better so I seem to be trusting it quite nicely,” he said. His compatriot Lee Westwood, who only made the cut on the level par limit, remained deep in the pack after a second round 69 moved him to one under par. Padraig Harrington needs to pick up two shots in 12 holes to make the cut in the Travelers Championship at TPC River Highlands today. Pictured here at last week’s US Open. Credit: Fran Caffrey/www.golffile.iePadraig Harrington will resume his weather-delayed second round in the Travelers Championship today needing to pick up at least two shots in 12 holes to survive the cut. The good news is that he will re-start facing a four footer for birdie at the seventh that should ease his burden. Padraig Harrington had just 24 putts in a third round 65 in the Travelers Championship.Padraig Harrington was at his aggressive best in Connecticut on Saturday when he changed chip following the discipline of the US Open at The Olympic Club and fired eight birdies in a five under 65 to challenge for the Travelers Championship at TPC River Highlands. Pádraig Harrington celebrates as his 51-foot birdie putt drops on the 15th in the opening round of the Travelers Championship. Pádraig Harrington put his US Open frustrations behind him when he reeled off a hat-trick of birdies at TPC River Highlands’ feared Golden Triangle to open with a four under 66 in the Travelers Championship in Connecticut. Padraig Harrington. Pádraig Harrington continues to confound. After putting brilliantly to open with two 66s in the Travelers Championship in Connecticut and then using the belly putter to turn a big score into a 72 on Saturday, the 41-year old crashed to the joint second worst round to par in his 18-year professional career last night.